^ World | Two die in Apache crash. BBC News. 1999-05-05 [2017-08-21]. ^ Noam Chomsky. 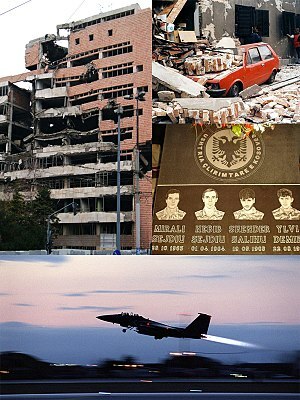 A Review of NATO’s War over Kosovo. ^ Caraccilo, Dominic J. Beyond Guns and Steel: A War Termination Strategy. ABC-CLIO. 2011: 44. ISBN 978-0-313-39149-1. ^ 千田善 (2002年11月21日).なぜ戦争は終わらないか ユーゴ問題で民族・紛争・国際政治を考える.日本：みすず書房. ISBN 978-4-622-07014-6. ^ Scientific Responsibility, Human Rights & Law Program | AAAS - The World's Largest General Scientific Society (PDF). Shr.aaas.org. 2017-08-09 [2017-08-21] （英语）. ^ Home | International Criminal Tribunal for the former Yugoslavia. Un.org. 2017-06-24 [2017-08-21] （英语）.